The Lunar New Year begins on February 10, and 2013 marks the Year of the Snake. The Lunar New Year, celebrated by people around the world including many of Vietnamese and Chinese descent, begins on February 10, and 2013 marks the Year of the Snake. To usher in the new year, nail tech Tin H. Pham of LA Nails in Hammond, La., constructed this 3-D snake made entirely of everyday nail items, including tips, glue, and glitter. The project took Pham more than 40 hours. “The hardest and most time-consuming part was creating the tongue. It is so small and easy to break when filing, and it has a wavy curve,” he says. Happy new year to all of our readers celebrating the festive occasion! View a slideshow of Year of the Snake nail art at www.nailsmag.com/snake2013. 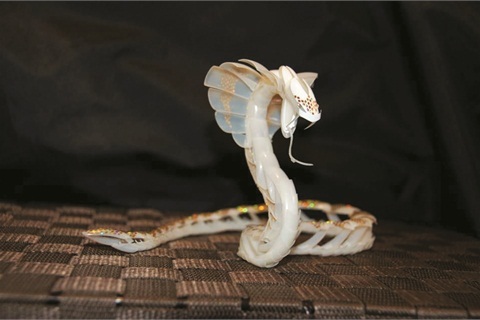 Check out a video of Pham's 3-D snake here.